The GoDaddy Bowl , also often called the Godaddy.com Bowl was previously (until early 2010) the GMAC Bowl. The game was also known in the past as the Mobile Alabama Bowl from 1999 to 2000 until it received corporate sponsorship from GMAC Financial Services, formerly a unit of GM (General Motors). In October 2010 it was announced that the GMAC Bowl was renamed to GoDaddy.com Bowl. But financial terms and the length of the agreement have not been announced for a while. The 2011 edition of the GoDaddy com Bowl will be played on Thursday, January 6, 2011. Kickoff will be at 7:00 p.m. CST, 8:00 p.m. EST and will be televised live on ESPN. The 2011 game marks the birth of this college bowl on the college football bowl schedule and under the new sponsor name. It showcases teams from the Sun Belt Conference and the Mid-American Conference, and will so through 2013.
www.GoDaddy.com is a well-known Internet domain registrar and Web hosting company that also sells e-business related software and services. In 2010, it reached more than 40 million domain names under management. Go Daddy is currently the largest ICANN-accredited registrar in the world, and is four times the size of its closest competitor. Known for its racy marketing, Go Daddy started advertising in the Super Bowl in 2005. Since then, the company expanded its marketing to include sports sponsorships. 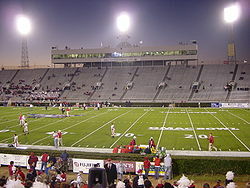 The Bowl (as GMAC Bowl and then as GoDaddy.com Bowl) has been played at Ladd-Peebles Stadium (formerly known as Ernest F. Ladd Memorial Stadium) on Field Turf (2004 - present) and grass (before 2004) since its inception. Buy your GoDaddy Bowl Tickets now before it is too late and be one of the tens of thousands enthusiastic fans in this great stadium.